slashings scattered over broad miles of the Thumb of Michigan, and the fire of 1871 piled up additional layers of windfalls and other debris. Then a drought in July and August, 1881 created what turned out to be the largest and most volatile tinderbox in the history of Michigan. There were spotty fires in many parts of the thumb during august, but never enough to concern anyone except the few settlers and farmers who lost a barnor a cabin. That all changed in early September, as hot, dry winds continued to blow, and came to a whirling climax during the early morning hours of Monday, September 5th. Suddenly, the entire thumb seemed to erupt into one gigantic catastrophe that proved to be one of most disastrous and widespread fires that the Midwest had ever seen. The conflagration roared up from the southwest, cutting a central swath that engulfed more than two-thirds of the Thumb, leaving only the western section of Tuscola and Huron Counties, and a few enclaves along the east shore of Huron and Sanilac Counties unburned. While huge area were consumed as completely as the inside of a furnace, there were exceptions in many places, as homes, farms and individuals were saved as surely as the hand of god had been placed over them as a protective shield. There were freak tragedies and there were freak escapes. Some people were saved by rushing into fields of green corn, and burying their bodies in the soil; one man crawled into the carcass of an elk he had just shot and gutted; some families were saved by lowering themselves into dug wells. The largest number - 400 people - saved themselves by taking refuge in the new brick county courthouse in bad axe. Men took turns pumping water and drenching the building through the day and night as the temperature in the building soared to 110 degree. While the building and its occupants escaped destruction, more houses and other buildings burned in bad axe than in any other town, although a few smaller villages were destroyed completely. in forested areas, the fire often appeared as a giant, swirling ball of spitting flames that moved high in the treetops, igniting one clump and passing another. When the fire finally burned itself out, there were 282 known dead, more than 3,400 buildings destroyed, and almost 15,000 residents homeless. Many were blinded � some temporarily and some permanently � by smoke, gusting dust and flying ashes that traveled faster than a whirlwind and blotted out the sun for days. Dollar losses, as recorded a century ago, pale when compared to today�s prices, but the destruction in buildings and timber, crops and animals was enormous. The response of the American people from all parts of the county was most generous, with greatest help coming, of course, from Michiganians themselves. Chicago, it is said, donated liberally, perhaps in remembrance of that city�s own fire tragedy 10 years earlier. The disaster relief sent to Huron County marked the founding of Disaster Services for the American Red Cross, and the county is recorded as the first place in the U.S. where The American Red Cross flew to denote active service to the suffering. While this brief account does not pretend to describe the Great Fire, it is meant only to call attention to the fact that this is an event that had an effect on every human being in the Thumb, and has been the subject of dozens of books and hundreds upon hundreds of news articles and essays. Call to Get Your Room!!! Loop 01 Sebewaing Charles W. Liken House, 325 N. Center, Sebewaing, 989-883-2391 or 989-883-2341. Rose Island Old Sebewaing Township Hall, 29 S. Center, Sebewaing, 989-883-2391 or 989-883-2341. Elkton Elkton Log Cabin Museum, Ackerman Memorial Park, Elkton, 989-375-2598. Caseville Caseville Museum, Maccabee Hall, 6733 Prospect St., Caseville, 989-856-9090. Harbor Beach Frank Murphy Museum, Harbor Beach. Harbor Beach White Rock School Museum, 10 mi. s. of Harbor Beach on M-25, then half mile w. on White Rock Rd. Pointe Aux Barques Pointe aux Barques Lighthouse Museum, 7320 Lighthouse Rd., inside Lighthouse County Park, Port Hope, 989-428-3035. Port Austin Port Austin History Center, 1424 Pointe aux Barques Rd., 1 mi. e. of the Pt. Austin traffic light, Port Austin, 989-550-5532. The town's name was derived from the Algonquian language of Native Americans, the original inhabitants of the area. Sebewaing, Michigan is in the north east part of the state, sort of by the "thumb." It's a unique name, supposedly from a native-American language meaning "wandering river" and indeed the town is on the Sebewaing River. The area was settled in the early 1850s and in sometime in the 1870s the first brewery was founded by an E. O. Braendle. His brewery was a hit, in part because the area's isolation meant that there wasn't much competition. In 1893 a fire destroyed Braendle's brewery but he rebuilt, this time with a partner, a Leonard Eberlsin, followed by Fred Kroll. A new brick brewery was built which was named the "Huron County Brewing Company" The brewery did well until Michigan went dry. Some local businessmen bought the former Huron County Brewing Company in 1924, and named their new firm the Sebewaing Products Company. They made malt extract, which was legal during prohibition because it could be used for baking, but in reality was usually used for home brewing. Like many other malt companies, Sebewaing did well selling its product. In the family of Mr. Volz there were 13 children. His youngest son John was born here in 1853. The village was named Sebewaing (in the Chippewa language, a river nearby). The river gradually taking the same name, although on the early maps it is called Du Fill (in French, Thread river). It was very winding and crooked in its course but navigable for small boats for about one mile. FIRST SCHOOL IN SEBEWAING The first school was taught by Rev. J. J. Auch in 1854. It was attached to the Lutheran church, of which Mr. Auch was pastor. He had about a dozen pupils in all. The waters of the bay teemed with fish and in the woods roamed the moose, deer, elk, bear, wolf, wild cat, lynx, and along the rivers were found the beaver, otter, muskrat and mink. Wild berries, seeds, insects furnished daily food for the bird life. On a spring morning the woods resounded with the music of these feathered songsters. Great flocks of wild pigeons used to almost darken the sky as they passed in their onward flight. Now that particular kind of pigeon is extinct. In 1868 men in the town of Sebewaing caught 16 barrels of these pigeons and sent them to the New York markets. Rose Island is an unincorporated community in the Township on Saginaw Bay at Rose Island and Haist roads. Valley Island is an unincorporated community in the Township on Saginaw Bay at Schuck and Valley Island roads. Weale is a Community in Huron County in the state of Michigan, United States. 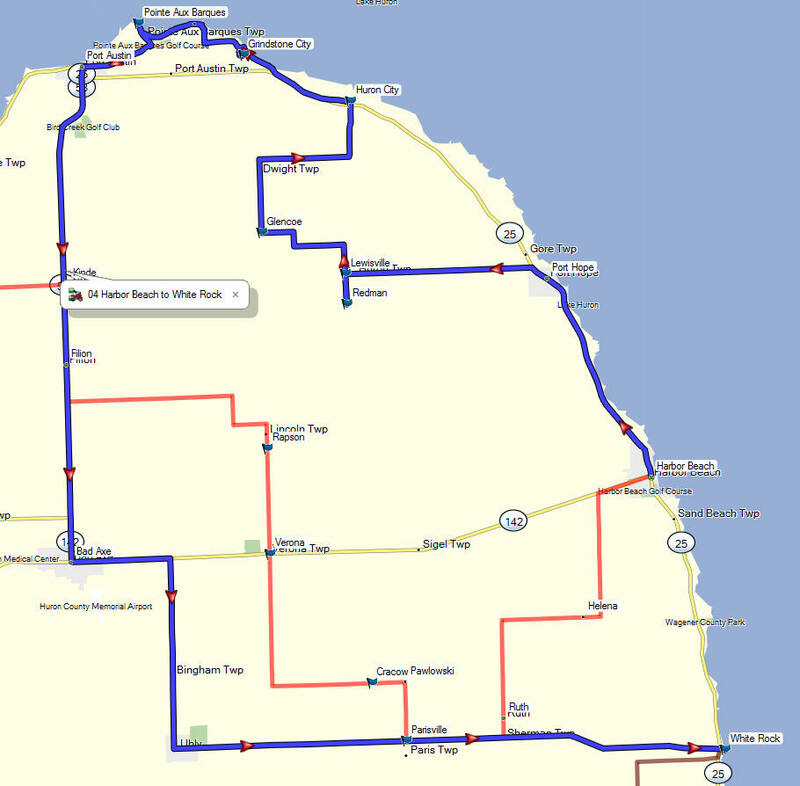 Bay Port is an unincorporated community in the township on M-25 on the shore of Wild Fowl Bay, which opens into the Saginaw Bay of Lake Huron. Each year, during the first full weekend of August, Bay Port hosts its annual Fish Sandwich Festival. Bay Port's unofficial motto is: "Where the fish caught the man" due to its easy lake access for sport fishermen. Carl H Heisterman founded Bay Port in 1851. It was first called Geneva, after Geneva, Switzerland, then Wild Fowl Port, from it's location on Wild Fowl Bay, and finally Bay Port. Bay Port is one of the best fish producing areas in the world, with a tremendous variety of fish. It has been the center of commercial fishing on the Great Lakes for over a century. Tons of perch, walley, herring, whitefish and carp are shipped to New York and Chicago in refrigerated box cars. Hunting of waterfowl includes a wide variety of duck and Canadian geese. There is game hunting too, including pheasants, rabbits, grouse and whitetail deer. Bay Port was settled in 1851 by Carl H. Heisterman. It was first named Geneva and later Wild Fowl Port. The post office was relocated here from Ora Labora in 1872. Ora Labora (Latin for prayer and labor) was a German religious-socialist colony 1.5 NE of Bay Port (1862-1872). In late fall/early winter of 1862, Emil Baur led a group fifty families to start a colony on the shores of Saginaw Bay. Baur was the founder of the (Methodist) Christian German Agriculture and Benevolent Society of Ora et Labora. The three words in Latin translate as prayer and work. The settlement was popularly known as Ora Labora. The settlement was modeled after the German settlement at New Harmony, Pennsylvania. Ora Labora was located on Wild Fowl Bay north of Bay Port. This location worked against the success of the settlement in that the water was too shallow for large ships to land, making it difficult to supply the colony, closest place to get supplies being down the Bay at Bay City. The colony had little money available for supplies, because most of their funds were spent buying the land. Many of the colonists were city people that needed to learn from the beginning about how to farm. The colonists also had to fight malaria, and the depletion of their ranks from their men being drafted to fight in the Civil War. The women and elders remaining could not handle the work required to sustain the farming operations. The colony struggled and finally collapsed in 1872. The Michigan Legislature passed an act reimbursing the German Christian and Benevolent Society for the construction of drains and ditches in State Swamp Lands. This act gave each head of household in Ora Labora the right to a homestead. Many chose to settle nearby in Bay Port and Pigeon. The Ora Labora post office was established in 1863 and moved to Bay Port in 1872 when the Ora Labora colony had failed. Berne was Founded in 1878 also known as Berne Junction or Berne Corner. It was named for Berne Switzerland. Around 1886 the Saginaw, Tuscola, and Huron Railroad built tracks through the tamarack swamp and crossed the north-south line one mile south of Berne; commerce swiftly moved to take advantage of the intersecting rail lines. Originally called Berne Junction, the new community quickly established its own identity and early settlers selected the name of Pigeon, which was taken from the name of the near by Pigeon River. The site of Pigeon was a swamp. It is said that 40 acres of land now in the center of the town, was traded for a gun. Vast stands of inland forests were harvested and the logs were floated to the sawmills at the mouths of the county's rivers to be cut into lumber. Small towns began to emerge in cleared areas where the dense forests once stood. Pigeon was one of the last of these towns to be founded. In 1883 the Pontiac, Oxford and Port Austin railroad line was extended to Caseville and a depot was built at Berne. Around 1886 the Saginaw, Tuscola, and Huron Railroad built tracks through the tamarack swamp and crossed the north-south line one mile south of Berne; commerce swiftly moved to take advantage of the intersecting rail lines. Originally called Berne Junction, the new community quickly established its own identity and early settlers selected the name of Pigeon, which was taken from the name of the nearby Pigeon River. The river was named for the huge flocks of passenger pigeons that fed from the marshy swamps along its banks. Observers said the flocks were so thick that, when in flight, they darkened the sky. By 1914 the pigeons were extinct. After incorporation as the Village of Pigeon in October, 1902, eight citizens were elected in December of 1902 as the first village council: A.G. Kaumeyer, J.W. Liepprandt, Louis Staubus, Joseph Schluchter, Albert Hartley, H.H. Gould, Harry Hershberg, and E.W.E. Bundscho. Charles Sting was treasurer and Warren Challis the assessor. There were 107 registered voters in the village and 102 of them cast ballots on election day. The railroad depot that now serves as the museum was constructed in 1908 and served two railroad lines: The Chesapeake and Ohio (C & O) and the Grand Trunk. The C & O was purchased by Huron and Eastern which currently operates the railroad. The Grand Trunk line has been abandoned. The village of Elkton was founded in 1886 by W. J. McGillivray, a blacksmith, who built the first house here. He named it to commemorate his killing a huge elk entangled in his wife's clothesline that weighed a ton. Popple is a tiny unincorporated community in the southwest corner of the township along M-53/S. Van Dyke Road between Pinnebog and Kilmanagh/Popple Roads about five miles southwest of Bad Axe on the Pinnebog River. In 1882, as three new railroads began to lay track in Huron County, two cousins from Saginaw, John G. and John S. Owen, bought land in the Columbia Swamp. The following year they opened a sawmill to harvest the native oak. John G. Owen hired Quincy Thomas, a civil engineer to survey a town site in 1887. The streets, alleys and parks were dedicated to the public for their perpetual use, and the village was named. The sawmill burned in 1896, and the Owendale area turned from lumbering to agriculture. Owendale, a village on the Grand Trunk railway and situated in Brookfield. This village was named after Mr. Owen, who was the principal factor in its early history. Linkville, Huron co. Grant Twp, was founded in 1870, and was first called Kilkenny, given a post office of that name on Dec 19,1879, with Henry D Hyser as it's first Postmaster, operating till Jan 9, 1883. The office was restored on Jan 31,1887, and Renamed Linkville , for Mr link, a homesteader on Sept 16,1892. this office was closed on April 30,1906, but was restored on Sept 5,1907 til Nov 15,1913. Kilmanagh, at the crossroads of four townships in Huron County, had a flouring mill and a sawmill, a general store, a boot and shoemaker and a blacksmith. The post office started in 1873. The hamlet was at first call Thompson's Corners for Francis Thompson, a Homesteader from Ireland who became the first postmaster. Kilmanagh is an Irish word first used to describe the Shebeon Creek, which overflowed each spring. The post office closed in 1904. Bach is an unincorporated community on the Township's border with Brookfield Township at Bach and Bay Port Roads with side streets (Liken and Bartholomy). Bach, Huron County: a station on the Michigan Central Railroad, in Sebewaing Township; the village was Founded by Frederick Fredrick Back in 1889 and named for him. Storekeeper Samuel Sussman became it's first poastmaster on November 5,1912. The proposed Pinnebog Preservation Society has done research of the area. It has found the area was settled from 1855-1860. The early families included: the Etzlers, Mayhews, Busheys, Waggoners, Carringtons, Winsors, Petersons and Donners. The hotel opened in 1882, and by 1894, many other businesses had opened. These included: R.A. Butler General Store, Spohn Drug Store, Wagoner Buggy Manufactory Bonner Family Gristmill, a harness shop, a creamery and cheese factory. An interesting piece of history was included in the committee�s information. It stated, �Pinnebog was originally called Meade Corners named after Gen. George Meade of Civil War fame. Today�s Port Crescent was originally named Pinnepog, which means Partridge Drum. The two settlements shared a post office upstream between the two towns. �When Pinnepog wanted a separate post office in 1863, they had to select a different name. Later, when the post office moved into Meade Corners, it assumed the name of Pinnepog. (But) the government made an error in the spelling and it came back Pinnebog. Businessman John Kinde arrived in Michigan's central Thumb area in the early 1880s and established a general store, lumber yard, grain elevator and post office. Train service began in 1882 with the construction of track by the Port Huron and Northwestern Railroad. Kinde was renowned as the "bean capital of the world." Michigan bean soup has been a staple for over one hundred years in the U.S. Senate dining room in the form of Senate bean soup. However, the Michigan Bean Festival on Labor Day weekend is held in nearby Fairgrove. Filion is an unincorporated community located on the border with Meade Township at M-53 and Filion Road, a small French-Canadian community founded in 1861, honey is the leading product, largest honey producer in Huron County. Rapson is an unincorporated community in Huron County in the U.S. state of Michigan, located in what is popularly called the Thumb portion of the Lower Peninsula. It is situated at the corners where four townships meet at Rapson and Verona Roads Bloomfield on the northeast, Sigel on the southeast, Verona on the southwest, and Lincoln on the northwest. Rapson was home to a one-room school house for 96 years. Officially known as Bloomfield Township District No. 7 Frl., students could attend from kindergarten through 8th grade. In its heyday, Rapson School had as many as 50 students. It closed in 2008 when enrollment dropped to just one student. St. Joseph's Catholic Church is the only church located in Rapson. The priest in residence also served Mass at Most Holy Trinity Catholic Church located 7 miles to the south in Smith Corners. The two parishes are in the process of merging with Sacred Heart in Bad Axe to create one unified parish. While Rapson was once home to 'The Grainery' bar, the building was then occupied by the Bad Axe Moose Lodge #2358. The Moose Lodge has since closed. VERONA TOWNSHIP Going away from the bay we find one of the older townships, Verona. The township was organized by act of legislature in the winter of '60 and '61, out of the following territory: Surveyed township No. 16 North of Range 13 East. The first township meeting was held at the home of Thomas Philp. He with Thomas Tear and Andrew McAllister were the inspectors of the election. At the time Verona was organized there were just 12 free holders residing within its jurisdiction. being just the required number to petition for a new township. Thomas Philp was the first settler and shortly afterward he was joined by Messrs George Martin, John and Thomas Scott and Andrew McAllister. These pioneers were about the only ones who had made any improvements when the township was organized. They deserve much credit for their bold courage in undertaking such anl arduous task knowing that they would have to do many a hard day's work, undergo many privations before sufficient improvements could be made to make themselves and families comfortable. With one exception, they had little or no means left after paying for their land and consequently like many others had to live out at different places on the lake shore to earn provisions and other necessities for their families. The log crop of 1873 was 80,000,000 feet. All logs were floated down the various rivers to the saw mills. Much of the success of getting the drives down depended upon the amount of water in the river in the early spring. All lumber camps were situated upon the banks of creeks or rivers. The logs were marked with the initials of the owners in readiness for the drive in the spring. SHINGLE MANUFACTURING The manufacture of shingles was also an important industry. The shingle mill of Puddock & Co., at Verona, had a record of making 35,000 shingles per day. Cracow is an unincorporated community at Priemer and Polk Roads in the Township. Found in 1862 with Polish settlers who named it after the Polish city. On June 8, 1869, a post office was opened with Frank Buchkowski as its first postmaster. The post office was closed on April 10, 1987. In the year 1854 three Polish families emigrated to Huron County from Canada. They were John Woytlewicz, Ambrose Chuknowski and Anthony Slavick, this Polish settlement, then four miles from Ruth, was named for Joseph Pawlowski. In 1856, five Poles from Canada founded Parisville in Huron County, the first Polish settlement in Michigan. Helena is an unincorporated community on the border with Sherman Township on Helena Road between Buhl and Klug roads. Helena founded by Alex Snetzinger about 1870, who named it for his wife; he became its first postmaster on Dec. 6, 1887. The earliest settlers to this area arrived in 1837 and established a sawmill for processing lumber. The settlement eventually was named Barnettsville in 1855, as the settlement continued to grow, the town was renamed Sand Beach. In 1899, the village of Sand Beach changed its name to Harbor Beach, because of the impression that the area has nothing but sand. In 1910, it was officially incorporated into a city. Located on western shore of Lake Huron in the Thumb of Michigan, Harbor Beach is known as having the world's largest man-made fresh water harbor and boasts a fishing pier that is handicap accessible. The municipal marina provides transient services and shuttle services into the downtown area which has retained its old town charm. The Murphy Museum and the Grice House Museum feature history of the area. The association known as HBRA was founded in 1896 as a summertime vacation spot in Harbor Beach. The resort is located roughly three hours north of Detroit, MI and is currently still operated, and frequented, by the 5th and 6th generation descendents of the original founding families. In 1851, William Stafford, while living in Lexington, bought the first parcel of land in what is now Port Hope, with Reuben Dimond. Later, Stafford and William Southard invested in buying up forty-acre parcels from the government. These parcels had been set aside as pensions for veterans of the War of 1812. Traveling to the area by schooner, Southard was let off at some distance from shore, due to a pending storm. Rowing in a skiff in the wind, he vowed that if he made it to shore, he would name the spot Port Hope. Stafford, along with others, opened up the area to lumbering and by 1858 his company dock was constructed and mills were in operation. The chimney from one of those mills can be seen and is the last standing chimney in Michigan from the lumbering era. Port Hope survived the 1871 fire and was able to return to lumbering, but after the second fire in 1881 the trees were gone, and farming became the focus. Stafford adjusted and built a flour mill, elevator and a new dock. Port Hope was incorporated in 1887, with the railroad coming in 1903. The first salt well in the village owned by the Port Hope Salt Company made annually about 45,000 barrels of salt. The second one was owned by R. C. Ogilvie and had a capacity of 200 barrels per day. Glencoe is an unincorporated community on the Township's border with Huron Township at Verona and Day Roads. It had a post office from 1901 to 1914. Huron City is an unincorporated community in the township on Pioneer and Huron City Roads near M-25 near the mouth of Willow Creek on Lake Huron It was formerly a lumber town, destroyed in the Port Huron Fire of 1871 and Thumb Fire of 1881, the town was rebuilt after each, but faded as the lumber industry died out. The post office was closed in 1905. Grindstone City is an unincorporated community in the eastern end of the township It was established in 1834. Michigan's Grindstone City as Grindstone Capital of the World of the once flourishing industry in this tiny town at the tip of Michigan's Thumb. This natural harbor drew Captain Aaron Peer to Grindstone City in 1834 when his schooner, the Rip Van Winkle, found safe harbor here during a storm on Lake Huron. The ship's crew went ashore to explore the wooded wilderness and found some unusual flat stones along the waterfront. Peer took stone samples to Detroit where officials found it superior to Ohio flagstone they originally planned to use to pave a small section of Jefferson and Woodward Avenues. Detroit ordered enough rock for the paving from Peer. Peer's sailors rigged up one of the stones to use for sharpening their tools, and Peer decided the stones would make excellent grindstones. In 1836, he purchased 400 acres of land, becoming the first person to locate land in Huron County, to establish a grindstone quarrying and manufacturing operation. The outcropping of Marshall Sandstone that Peer discovered was an abrasive stone with a very fine grit unique to Grindstone City and perfect for grindstones, scythe stones and hones. Worldwide demand soon earned the town the nickname of Grindstone Capital of the World. The town became largely a company-built town, with homes, a grist mill, wharfs, and a booming industry with two quarries. A salt mining operation produced 125 barrels of salt each day during the 1870s, and the first railroad built into Grindstone City began transporting the stones by rail in the 1890s. About 80 men worked at the quarries by 1870. By 1888, the Cleveland Stone Company bought property owned by other companies to become the sole quarry and grindstone company in town, employing about 150 men and manufacturing 35 to 40 tons of grindstones each day. Grindstones varied from about 2-1/2 pounds to behemoths weighing more than two tons, ranging from about 6 inches in diameter to diameters as long as 6 feet. The largest grindstone turned at Grindstone City weighed more than 6,660 pounds. Quarrying and manufacturing grindstones was extremely labor-intensive. Much of the work involved hand tools, and perhaps a few steam operated engines, derricks or horse-drawn vehicles. Sharpening materials like carborundum became popular during World War I. Natural grindstones produced a finer edge, but inexpensive carborundum ultimately replaced the natural stones. The grindstone industry at Grindstone City died in 1929. At the corner of Copeland and Rouse Roads, in Grindstone City, is a huge grindstone donated to the town by the Cleveland Stone Co., in honor of the pioneers who spent their lives working at the grindstone industry here. Mr. Steve Kreinke picked and shaped the base stone on which the large stone rests. It was dedicated to The Pioneers of Grindstone City by Dr Wm. Lyon Phelps of Yale University on Sept. 3rd, 1935. Dr. Phelps was the head of the Literature Dept. at Yale and had a summer home "The Seven Gables" at Huron City. This stone said to weigh 4750 lbs. stands as a fitting tribute to a very important industry that was once famous as the only place in the United States where this particular stone is found. The Pointe Aux Barques Lighthouse and Lifesaving Station was established in 1847 on Lake Huron near Port Hope in Michigan's Thumb June 5, 2014. Port Austin has a rich history that can be traced back to 1837 and its first settler, Jonathon Bird. The greater Port Austin area is recognized for its superior dining establishments and its unique shops. Downtown Port Austin also boasts an extended boardwalk and pier, home to some of Lake Huron's finest fishing. 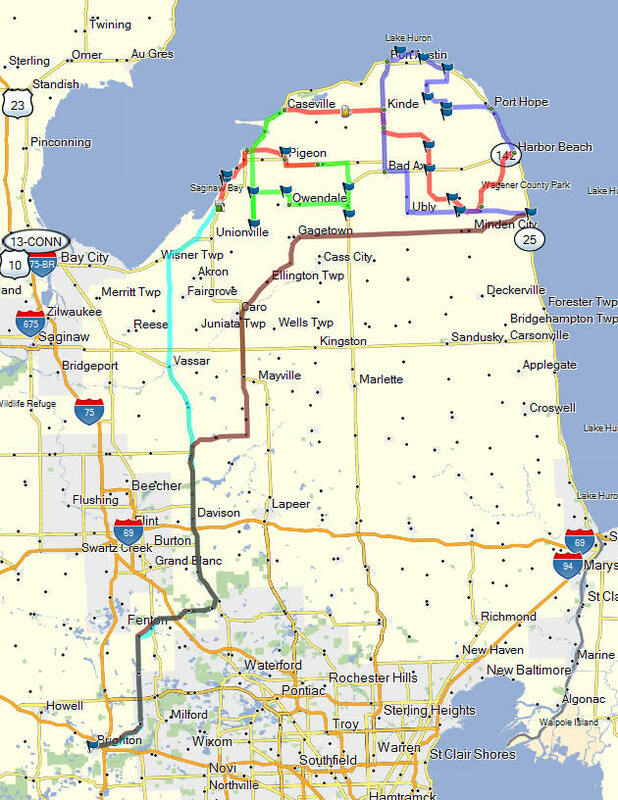 The area is well-known throughout Michigan for its historic sites that continue to draw hundreds of visitors each year. The Bank-1884 Food and Spirits, located downtown, used to be the city bank. Remodeled with care to ensure its historical accuracy, it is now one of the area's finest restaurants and renowned throughout the state. Another historical restaurant is the Garfield Inn. Not only does it serve four star cuisine and bed and breakfast, it's history is shouded in legend as it was the secret meeting place of then President James A. Garfield. The legend goes that Garfield was smitten with the mistress of the house - the wife of his best friend. They carried on a secret affair for many years and often sent bawdy love letters. When Garfield was mortally wounded by an assassin's bullet he was taken to the house, a place he truly felt at home. SALT MANUFACTURE The manufacture of salt was started at Port Austin in 1863. Later there were wells at Port Crescent, Caseville and Port Hope. The city was established in 1905. The city's unusual name dates to the time of its settlement. In 1861, a surveying party in charge of Messrs. Pack and Papst, started out to locate a route for a public highway from Sand Beach to Sebewaing, for which the State legislature had made an appropriation. In the prosecution of their work they finally reached the mineral spring just north of the village, where, pitching their tents, they remained for a time. This had been a favorite place for sportsmen for many years, and a rude hut had been put up here for their accommodation. While here, one of the party found an old broken ax, which he took up and drove into a tree near by. One of the other party made a drawing on the tree of the now historical ax, and wrote underneath it, " Bad Axe " from which the village took its name. This tree was at the point where the road crosses the town line between the two townships, Verona and Colfax; and from this time on this place was known as Bad Axe Corners The first post office in Bad Axe was established in 1870. The Village of Ubly was first known as Sidon, being north of Tyre as in the Bible. Later it was called Pagetts Corners after Mr. Alfred Pagett who erected a general merchandise store at the west end in April 1870 which was destroyed by the fire of 1881. In 1880 a number of men met to talk over applying for a local post office. Those present wanted to call it Pagettville but Mr. Pagett declined and suggested Ubley, after a little town he knew back in England. When the application came back, whoever had filled in that part in Washington had spelled it Ubly. White Rock is a tiny unincorporated community of Sherman Township at the southeast corner of Huron County in the U.S. state of Michigan. The community is at the mouth of White Rock Creek on the shore of Lake Huron, about three miles north of Forestville and about nine miles south of Harbor Beach on M-25 at the junction with White Rock Road. The community is named for a large white boulder offshore in Lake Huron that was used as a boundary marker to define the territory ceded by Ottawa, Chippewa, Wyandot, and Potawatomi with the Treaty of Detroit in 1807. The boundary definition in the treaty began with the "mouth of the Miami river of the lakes" or what is now known as the Maumee River at Toledo, Ohio. From there the boundary ran up the middle of the river to the mouth of the Auglaize River at what is now Defiance, Ohio, then due north until it intersected a parallel of latitude at the outlet of Lake Huron into the St. Clair River. This north-south line would become the Michigan Meridian used in surveying of Michigan lands. 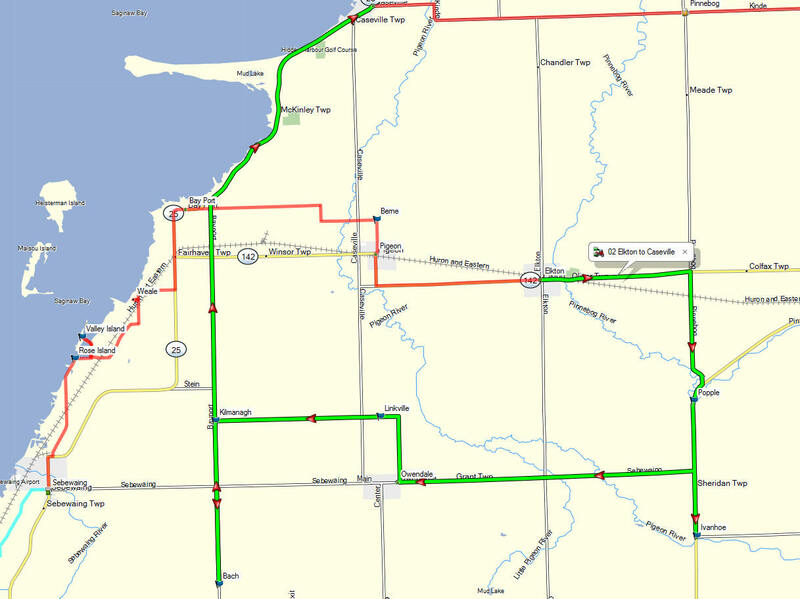 The intersecting parallel of latitude crossed the meridian at the northeast corner of what is now Sciota Township in Shiawassee County in the middle of the border with Clinton County. From this point the treaty boundary ran northeast to White Rock in Lake Huron, then due east to the international boundary with what was then Upper Canada, and then along the international boundary through the St. Clair River, Lake St. Clair, the Detroit River and then into Lake Erie to a point due east of the mouth of the Maumee River, and finally west back to the point of beginning. The Michigan Department of Transportation began construction of White Rock Roadside Park along M-25 in 2000. Completed in 2003, the small park has a parking lot, outhouses, a historical marker, picnic tables, scenic overlook and public access to the beach of Lake Huron. used as a landmark for treaties between the United States and the Anishinabeg.